Ignition coil development had been a long-time dream of our CEO, and we had heard about his determination to make this dream come true for a long time. But since such development requires both time and money, we conducted our R&D activities over the years by receiving funding from Akita Prefecture and so on. First, we accumulated the coil and fusing technologies, studied what kind of parts were used in ignition coils by taking apart many automobile electric components, and collected information through the cooperation of related parts and material makers. We then came up with numerous prototypes and conducted tests repeatedly. 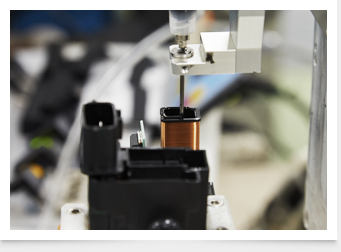 We became aware that plastic molding technology served as the basis for ignition coil development. Hence, replacing metal with “Super Engineering Plastic,” we tried to thin down this new material to a minimum weld line thickness without cracking, while avoiding it from emitting gas. This thin plastic molding technology eventually became the decisive factor for producing our high-quality ignition coils. 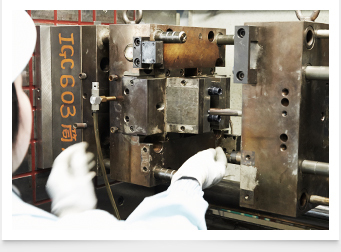 Thin plastic molding is a complex skill that has taken a considerable amount of hard work to acquire and perfect. But this thin molding technology is most important and indispensable for the stable supply of our ignition coils. Ignition coils are produced by combining primary and secondary coils. Primary coils are about 0.5 – 0.6 mm, while secondary coils are approximately 0.04 mm. These two, hair-thin coils are wound up around 20,000 times. In this process, it is most important to wind the two coils up aligned, because unaligned winding could result in short circuits or electric voltage fluctuations. In addition to aligned winding, equally important at this stage is the measurement precision of the bobbin mold. Then, epoxy resin is injected in vacuo, and the interior is sealed. The vacuum environment is crucial since the internal structure of an electronic part must be completely water/moisture proof, and the ignition coil requires an additional function of being voltage proof. Hence, careful vacuum ratio and injection speed control become exceptionally important at this stage, since the inclusion of air bubbles may cause problems such as short circuits or fluctuations in the electric voltage. 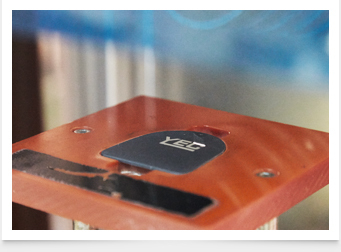 Since electrical disorders may be caused by the inclusion of foreign substances or dust, YEC produces its ignition coils in a high-grade clean room. 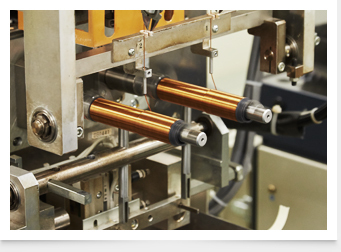 Ample experiments are conducted on the product to evaluate its reliability, by using various testing equipment. The product is also installed in an actual car to conduct test drives. Our factory is located in Akita Prefecture that has heavy snowfall, and the exterior temperature drops to minus 30 to 40 degrees Celsius during winter. Also, the altitude is high with steep slopes and deep valleys: making it an ideal testing ground for our ignition coil-installed cars to confirm their high reliability. We also work to upgrade our product quality on a daily basis, by listening intently to the evaluations and feedback from the market. 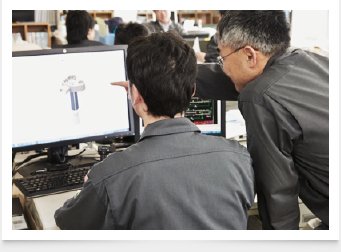 For example, if in case there was a penetration destruction or spark stop caused by a short circuit, we would immediately turn our attention to our customers’ feedback, and have all sections at our factory including Quality Assurance, Manufacturing, Production Technology and Development, pursue the cause of the disorder, and work together to solve the issue and upgrade the product quality further. Giving top priority to “listening to the feedback of our customers,” we make sincere efforts to enhance the quality of our products on a daily basis, by applying the precious “opinions and information” provided to us on our development and improvement activities.